Cuba has seen a recent spike in visitors from the United States thanks to amendments to the Cuba Sanctions regulations and the subsequent re-establishment of regular flights from several U.S. cities to the Caribbean island’s populous capital. “Visitors who go to the island will find a friendly, educated and open citizenry with a long, proud history,” says Plácido Sánchez Vega of Mega Yacht Services, based in Cuba. “Culturally, you will find people who love all music — chamber music, fiery Latin jazz, congas of Santeria, rumbas. The world-class art, dance and film scene...is flourishing.” And since Havana “has been ‘forbidden fruit’ for [decades], just seeing it is enough for most visitors,” says Gerald Berton, president of yacht services agency Cuba Seas. He recommends Marina Hemingway, 14.4 kilometres west of Havana, as a good bet for those on a luxury yacht charter in Cuba to begin with. A multi-day city exploration is a must, including a walking tour of Old Havana, founded by the Spanish in 1519. Afterwards, shop in arts and crafts markets at Parque el Ejido, Paseo del Prado and car-free Calle Obispo, view bright murals at Muraleando and step into the fantasy mosaic world of Fusterlandia. Cruise to Plaza de la Revolución (Revolution Square) in a car that pre-dates the 1960 trade embargo, stroll the Malecon and dance the salsa outside to live music at Club 1830. On another day, tour a cigar factory or visit Hemingway’s Cuba house, Finca Vigia (Lookout Farm), 16 kilometres east of the city, where the famous author wrote The Old Man and the Sea. Top it off with an evening show at the Tropicana. Next, travel a few hours south by private van to Trinidad and the Valley de Los Ingenios, a museum of Cuban sugar production, overnighting in a private villa in Cienfuegos, founded in 1819 and arranged around a spectacular bay. Rejoin your yacht at Marina Gaviota Varadero, about 130 kilometres east of Havana, and spend a day exploring Varadero’s beaches and caves before heading home. 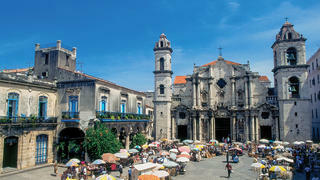 *When to go: *Cuba’s weather is subtropical; according to Vega, late November until June is the best cruising season. *Where to eat: *Vega recommends La Guarida, a private restaurant (or paladar), as well as La Cocina de Lilliam, a family-owned restaurant in “a stunning garden setting where President Carter ate when he visited Cuba.” Start with fried chickpeas and a grilled fish fillet then satiate your appetite fully with tres leches cake and cumin ice cream. Delicioso! 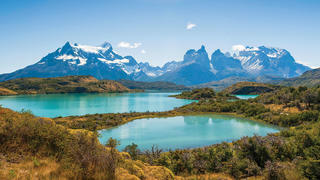 One of the best adventurous destinations to visit by superyacht, Chile’s coast is long, nearly 6,500 kilometres and the Chilean fjords can be divided into three main cruising areas from north to south: the Chilean Lake District and Chiloé Island; Torres del Paine and the Chilean fjords; and Tierra del Fuego and Cape Horn. If you have three weeks to explore, you could visit all three; however, if you only have a week or so, it’s best to concentrate on one region. For the Torres del Paine cruising area, begin with a land program in Torres del Paine National Park, a UNESCO World Biosphere Reserve with hiking opportunities ranging from several hours to a week or more. Afterward, join your explorer yacht in Puerto Natales and begin your fjords journey with the challenging Kirke Narrows, known for its powerful currents. “You can easily spend several days in this area, discovering hidden bays and untouched islands,” says Stünkel. Next, continue south east to Chile’s third-largest national park, Alberto de Agostini, with its islands, peninsulas, channels, glaciers and snowdrifts. While here, “take the opportunity to experience Patagonia’s ‘cold rain forest,’ ” recommends Stünkel. In nearby Karukinka Natural Park, at the edge of the Tierra del Fuego, scout for condors, albatross and petrels, as well as elephant seals. Finally, cruise north into the Magellan Strait to Magdalena Island National Park, home to approximately 60,000 pairs of Magellanic penguins, before disembarking at Punta Arenas. *When to go: *December through February offers the most favourable weather conditions. *Where to eat: *Travellers should visit the Shackleton Bar in Punta Arenas, recommends Stünkel. The bar is located in the luxurious José Nogueira hotel, Don José and wife Sara Braun’s former mansion. It was 100 years ago that Antarctic explorer Ernest Shackleton came here seeking help to rescue his trapped men. The Sea of Cortez, the 700-mile-long body of water between the Baja California Peninsula and Mexico’s mainland, “is a fabulous charter destination for many reasons,” says Ben Lyons, CEO of EYOS Expeditions. “First, it is one of the most amazing spots, anywhere, for marine mammal watching. The abundance of cetaceans of all sizes — from pods of hundreds (or even thousands) of dolphins to wonderful encounters with blue whales — is overwhelming and a must for anyone exploring Baja California by luxury yacht. “Also, the desert landscape stretches right to the sea, producing a beautiful contrast of cactus and sand dunes with brilliant blue sea. And, of course, it is relatively unknown as a charter destination, so you won’t find yourself crowded in by other yachts.” Begin and end your seven- to 10-day charter in La Paz, suggests Lyons. The city “offers easy air connections and facilities on shore; the more remote and wild destinations are only a short sail away; and it is infinitely more relaxed and welcoming than Cabo San Lucas.” From La Paz, Lyons recommends setting a northerly course, first visiting Isla Espíritu Santo, which has lovely bays, protected beaches and rich marine life — an ideal place for kayaking, swimming and snorkeling, as well as hiking on desert trails. From here, proceed to uninhabited Isla San Francisco’s long beaches, which also offer swimming, walking and kayaking opportunities. Then venture farther up the Sea of Cortez to Isla Santa Catalina, says Lyons, where cactus forests provide an opportunity for a morning leg stretch and the nearby waters beckon to be explored via kayak or snorkel. “And amid it all, keep your binoculars at hand while simply cruising these rich waters in search of its abundant sea life,” he adds. *When to go: *“December can be a bit windy, so January to April offers the ideal mix of temperature, weather and wildlife,” says Lyons, because summer can be too hot and fall misses the annual grey whale migration. “Visitors then would miss out on the experience of possibly getting up close and personal to some of the friendly grey whale calves that return each year to certain lagoons.” *What to do: *Snorkel or dive with curious California sea lions at Los Islotes, north of Isla La Partida, recommends Lyons. “They are playful and energetic, often swimming right toward snorkelers before veering off at the last second. Their underwater grace is beautiful to watch, and often, if you blow bubbles, you may find they come and play in them.” *Must-see spot: *Many visitors spend a day or two in La Paz on either side of their trip, says Lyons. “The malecon, a tiled walkway along the shore, is a favorite among locals and tourists alike.” Walk or jog along its approximate three-mile length, checking out the sculptures that adorn it, and then pause for a beer and people watching. The Sea of Cortez, the 700-mile-long body of water between the Baja California Peninsula and Mexico’s mainland, “is a fabulous charter destination for many reasons,” says Ben Lyons, CEO of EYOS Expeditions. “First, it is one of the most amazing spots, anywhere, for marine mammal watching. The abundance of cetaceans of all sizes — from pods of hundreds (or even thousands) of dolphins to wonderful encounters with blue whales — is overwhelming and a must for anyone exploring Baja California by luxury yacht. From La Paz, Lyons recommends setting a northerly course, first visiting Isla Espíritu Santo, which has lovely bays, protected beaches and rich marine life — an ideal place for kayaking, swimming and snorkeling, as well as hiking on desert trails. From here, proceed to uninhabited Isla San Francisco’s long beaches, which also offer swimming, walking and kayaking opportunities. Then venture farther up the Sea of Cortez to Isla Santa Catalina, says Lyons, where cactus forests provide an opportunity for a morning leg stretch and the nearby waters beckon to be explored via kayak or snorkel. “And amid it all, keep your binoculars at hand while simply cruising these rich waters in search of its abundant sea life,” he adds. 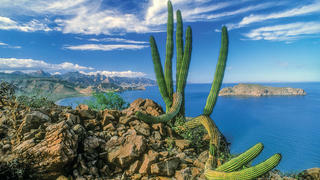 *Must-see spot: *Many visitors spend a day or two in La Paz on either side of their trip, says Lyons. “The malecon, a tiled walkway along the shore, is a favorite among locals and tourists alike.” Walk or jog along its approximate three-mile length, checking out the sculptures that adorn it, and then pause for a beer and people watching.